Welcome to the 2019 Rally! 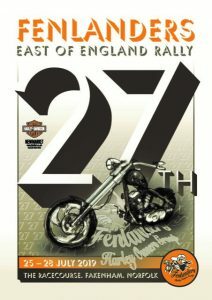 Even Bigger and Better than ever we have the same huge line-up of big name bands and exquisite ride-outs through the best of the Norfolk Countryside, culminating in the thrilling ride into Sheringham where we are greeted by cheering crowds along the roadside and by the Town Mayor. Booking for Tickets, T-Shirts, Glamping HOG Pens, Electric Hook-ups and Motorhomes Over 28 feet long remain available via the usual booking form with a posted Cheque to Ali. Click Here for the 2019 booking form.